Happy Saturday everyone.. I hope you are enjoying your weekend. 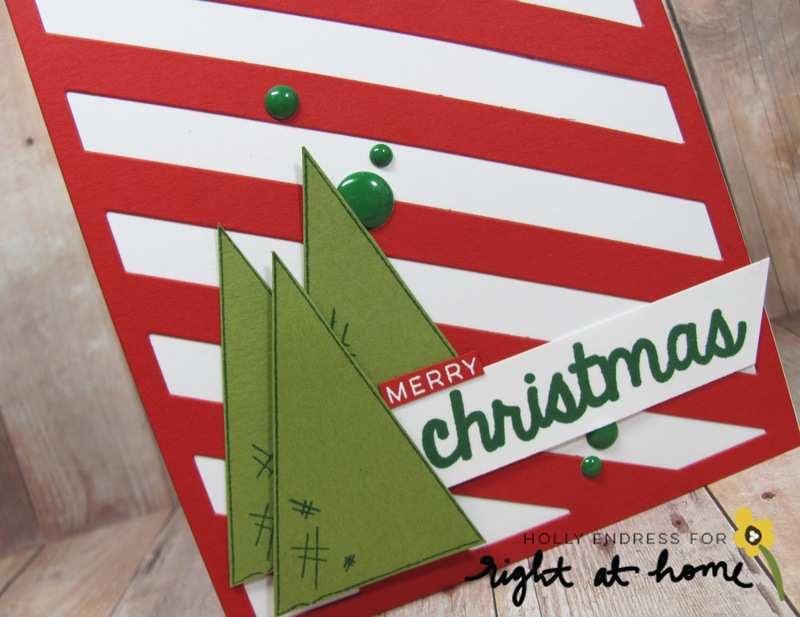 I've got two cards for you using the newest release from Right at Home. This is Nicole's third release and it's just as Fab as the last two! You can find all of the Right at Home releases in their shop. 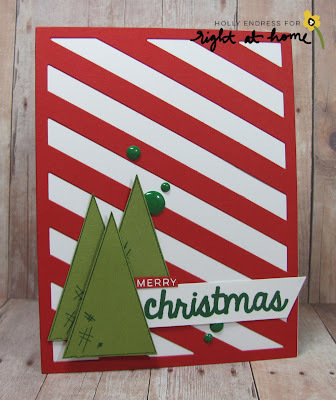 My first card using the sets Christmas Critters and Christmas Sentiments. I started with a White card base and I added a layer of Red card stock die cut with a diagonal stripe cover plate from Papertrey ink. Then I stamped the tree outline onto a piece of Olive card stock using some Noble Fir ink from Lawn Fawn. I added a few of the hash marks on the trees as well. The sentiment is stamped onto a piece of White card stock in Noble Fir ink as well and trimmed into a flag shape. I stamped the Merry from another sentiment in the set onto a piece of the Red card stock and heat embossed it in White and trimmed it out. For a pop of some more Green I added some Enamel dots in different sizes. My second card using the Poinsettia and Christmas Sentiments sets. I created a Sand colored card base and I added some white stripes along the side with a stencil from SSS and some Lawn Fawn Yeti ink. I stamped the sentiment in the lower corner and heat embossed it in White. 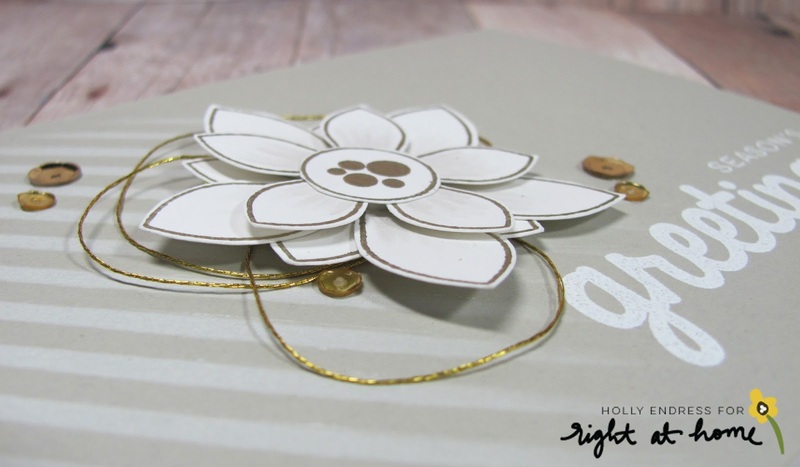 I stamped the Large and Small Flower outlines onto some White card stock and heat embossed them in Gold. I added some shading to the petals with the W Copics and I stacked 2 small and a large together to make the flower. I added some Gold thread and Gold sequins from Pretty Pink Posh for a bit more sparkle. Head over to the Right at Home Shop and check out all of Nicole's sets and the Right at Home Blog for more inspiration using these sets.